By taking the lead of the company, he realizes he was doing the same thing as his father had done all the time. He took a drastic decision: develop the trade in garden articles and stop with the transport business. Easier said than done! His father had recently invested heavily in new equipment and there were financial loans and outstanding leasing contracts. The next years he and his mother were fighting banks, leasing companies, trying to sell off equipment without too much losses. In the meantime they had to develop the trade business in garden articles. He had to make a shop for the products where people could select what they wanted to buy. He was advertising in local newspapers, attended trade fairs, made brochures and even a website (1995!). In the next 3 years “van der Meer Garden Products” was one of the biggest and most popular garden shops in the wide area. One of the recent new trucks he had to sell off. 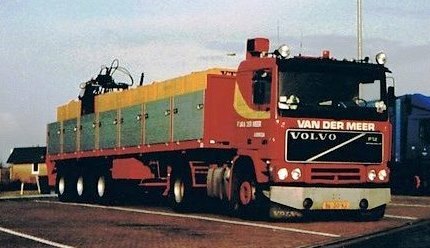 A Volvo F12 with 360HP and a Vogelzang trailer.